The Archive has several discreet collections of photography, the largest being the General Photography Collection. All of the processed photography collections are indexed in keyword searchable PDF files from the Graphics tab of our webpage. 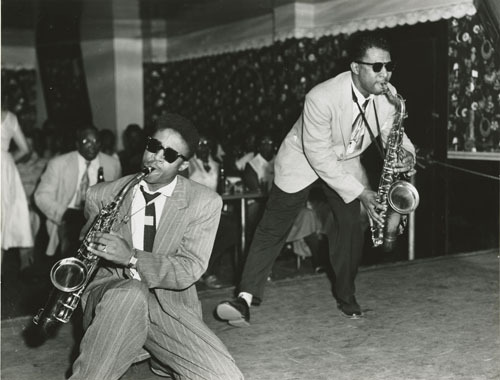 The Ralston Crawford Collection of Jazz Photography, and the General Photography Collection have been digitized and is accessible via the Tulane Digital Library (TUDL). Included among the photographers in the collection are Ernest Bellocq, Arthur P. Bedou, Villard Paddio, John Kuhlman, Don Perry, Florence Mars, William Russell, Alden Ashforth, Lee Friedlander, Bill Gottlieb, Ray Avery, Jack Hurley, Grauman Marks, Harriet Blum, Michael P. Smith, and many others. Ralston Crawford (1906-1978) was Canadian painter, lithographer and photographer. He first visited New Orleans with camera in tow in 1938 and returned nearly every year for the rest of his life. 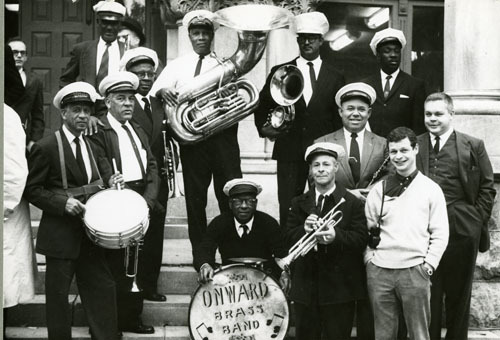 A longtime jazz enthusiast, Crawford was drawn to the city’s parades and second lines, its bars and clubs, and of course, its musicians, many of whom he considered his closest friends. In 1949, during his tenure as visiting artist at Louisiana State University, he began methodically documenting the musical culture of the city through photography. The Hogan Jazz Archive’s Ralston Crawford Collection of Jazz Photography was acquired in 1961 and includes 741 of what Crawford deemed his best images New Orleans images. All of the photos have been digitized and are available on the Tulane Digital Library (TUDL). Danny Barker (1909-1994), banjoist and guitarist, and vocalist Louise “Blue Lu” Barker (1913-1998) are a beloved couple in New Orleans Jazz history. This collection includes photographs, slides, negatives and greeting cards from their personal collection. Raymond "Ray" Bauduc (1909-1988) was a New Orleans-born drummer who became one of the most successful drum stylists of the swing era, performing with The Scranton Sirens, Joe Venuti and Eddie Lang, the Ben Pollack Orchestra, and the Bob Crosby Orchestra, where he was featured in a ‘band within a band,’ the Bob Cats. Bauduc was an avid amateur photographer as well, and his collection contains his own work, as well as abroad coverage of the bands and performers with which he was associated. In January 1958 Mina Lea Crais and her husband, attorney and jazz trombonist Bill Crais, took over ownership of the Vieux Carré Music Shop at 706 Bourbon Street. They would later become part owners of Carnival Records and talent scouts for Golden Crest Records. The Mina Lea Crais Photography Collection provides a glimpse into the world of New Orleans jazz, showcasing photos from festivals, recording studios, jazz funerals and parades, as well as notable musicians such as the Basin St. 6, Sharkey Bonano, Paul Barbarin and Billie and De De Pierce. Max Kaminsky (1908-1994) was an accomplished musician at an early age, first playing the cornet before embracing the trumpet as his instrument of choice. He began his career in Boston before moving on to Chicago and New York where he could collaborate with musicians of the same caliber. Although Kaminsky was not from New Orleans, his family believed his lifelong love of New Orleans jazz made the Hogan Jazz Archive at Tulane a fitting repository for his materials upon his demise. The Max Kaminsky Photography Collection chronicles a fascinating life, with photos from his time in the navy, world tours, iconic jazz institutions and performances with artists including Eddie Condon, Jack Teagarden and Pee Wee Russell. Robert Franklin Palmer (1945-1997) was a writer and critic, working for Rolling Stone and later the New York times. He authored Deep Blues and Rock and Roll: An Unruly History among other works. Palmer’s collection of photographs documents not only his own life, but also serves as a window into the evolution of Rock and Roll in the 20th Century. The Al Rose Collection includes hundreds of historic jazz photographs, many that were used in conjunction with Rose’s publication, New Orleans Jazz: A family Album. The works of several distinguished contemporary photographers such as celebrated art photographer Lee Friedlander, and reputed amateur jazz photographer Dr. Bernard Steinau are featured.